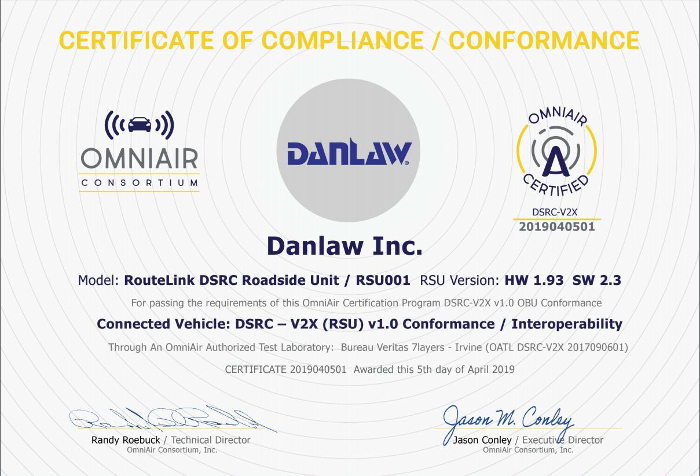 Danlaw, a Michigan-based developer of connected car and automotive electronics systems, has announced that its RouteLink DSRC roadside unit (RSU) for vehicle-to-everything (V2X) communications applications has received OmniAir Consortium certification. As a driving force behind V2X systems that use DSRC (dedicated short-range communications), Danlaw’s connected vehicle and infrastructure equipment enables smarter cities, safer roads, and more efficient transportation systems. Achieving OmniAir Certification ensures that the company’s RouteLink RSU adheres to critical performance and interoperability standards, providing a high level of assurance to automotive OEMs, Tier 1 suppliers, and government entities. 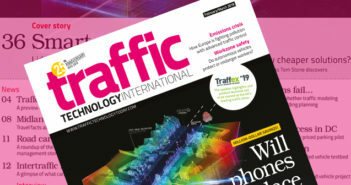 Along with Siemens’ Sitraffic ESCoS RSU, RouteLink is one of two certified roadside units on the market, and joins the AutoLink onboard unit (OBU) and Mx-DSRC Conformance Test System as Danlaw’s third V2X product to earn OmniAir Certification for V2X Wireless Access in Vehicular Environments (WAVE) standards. In 2015, Danlaw was selected by the US Department of Transportation (USDOT) to develop a certification environment for the testing and validation of connected vehicles using the DSRC standard, ISO 802.11p. The company’s RouteLink RSU is now a core component in connected vehicle programs aimed at improving safety and reducing congestion in urban environments. 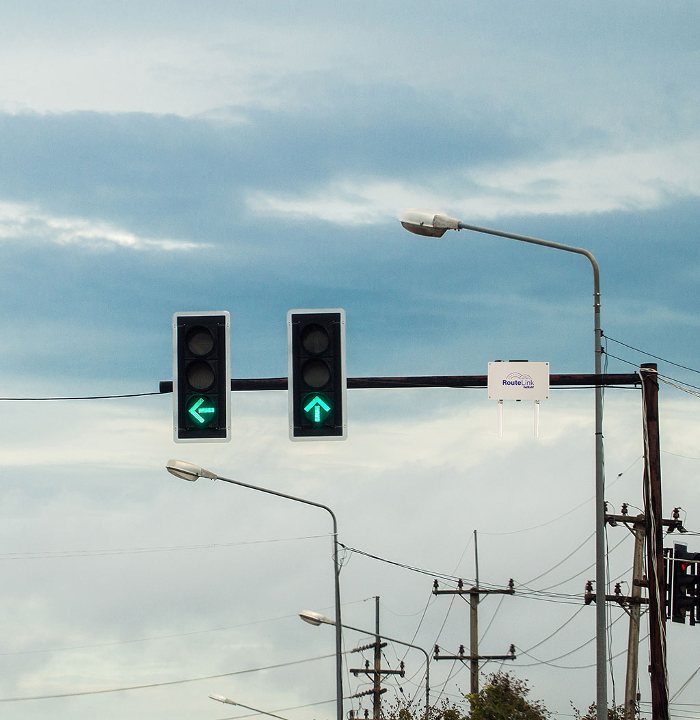 RouteLink facilitates communication with roadside infrastructure, such as traffic signals or crosswalks. The device identifies potential threats and uses DSRC to transmit critical safety messages to vehicles equipped with OBUs. The driver of the vehicle will receive audio or visual alerts for various vehicle-to-infrastructure (V2I) events, such as a red-light violation warning or curve speed warning. Concurrently, RouteLink will communicate with a central traffic management system to relay the location and heading of nearby OBU-equipped vehicles in order to coordinate the flow of traffic and ease congestion. RouteLink enables critical Smart City applications, including traffic signal preemption for first responders, transit signal coordination for public transportation vehicles, and traffic congestion management. 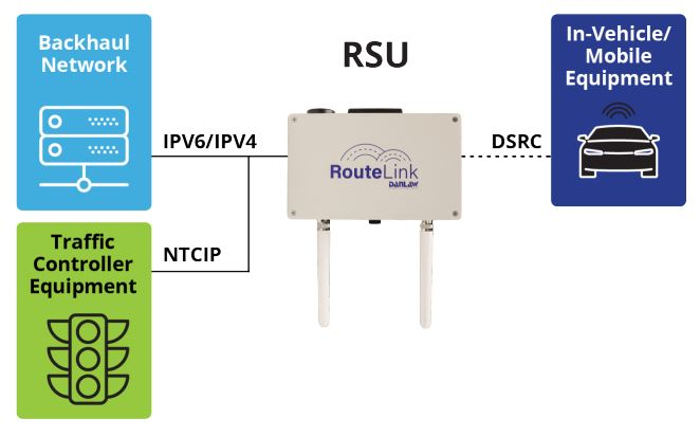 As one of the few RSUs to comply with USDOT’s FHWA Specification, including full support for the Simple Network Management Protocol version 3 (SNMPv3), RouteLink seamlessly integrates into existing road networks and pilot program systems. 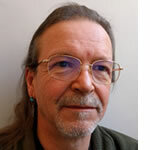 RouteLink is integral to several active connected vehicle pilot programs in the USA, including local initiatives with Macomb County and the University of Michigan Transportation Research Institute.